Enjoy the quiet location with Hilton Park across the road for children to play. Tennis racquets, DVD's, books, and fun board games are provided for wet days. For your comfort, a heat pump is provided. There is a separate toilet. There is a covered outdoor living area which has a 6-8 seater table and chairs, with an additional 4 seater table with chairs and umbrella. A SS 4 burner BBq is provided. A fish filleting bench and hose are provided for your convenience. This property was awarded a silver in the 2016 Batch of the Year in the "Pet Friendly Category". Whitianga is centrally located to Whangamata, Waihi, Tairua, Hot Water, Cooks and Hahei Beaches. There are numerous walks including the famous New Chums beach which can be acessed at low tide from Whangapou Beach. Other attractions are our own natural thermal pools and spa "The Lost Springs. Boat and diving charters are available. Children can visit the Bird Park, Mini Putt Golf and Wilderlands. During Summer months local organic produce can be purchased from the Coroglen Farmers Market. Well behaved pets allowed but prior approval is required. We would ask that dogs are not permitted on the couches or in the bedrooms but they can sleep in the wash house which is located off the lounge. Prices are negotiable for long term stays. Please inquire about pricing if you wish to bring your own linen. A cleaning fee will apply for ONE NIGHT stays if you require linen. A short term rental contract will be issued upon acceptance of your booking. The Robinson Boat ramp is located 1 minute away. Dog walking at the nearby estuary is permitted. This holiday home had everything we needed and we thoroughly enjoyed our stay here and would recommend to other friends and family. Thanks so much for having us. Initial issue resolved great communication and a beautifully homey home. We were very comfortable as was our dog! Convenient location and a clean well equipped batch with everything you need. Great for the Dog too! Enjoyed our stay here in Whitianga. The batch is perfect for a family and pet friendly. Everything you could need was available and there was a great selection of DVDs and games for those rainy days. A couple of issues with a noisy neighbour but this quietened down and the hosts resolved this issue. All in all a great break. Great location, fully fenced great for our family dog and children. 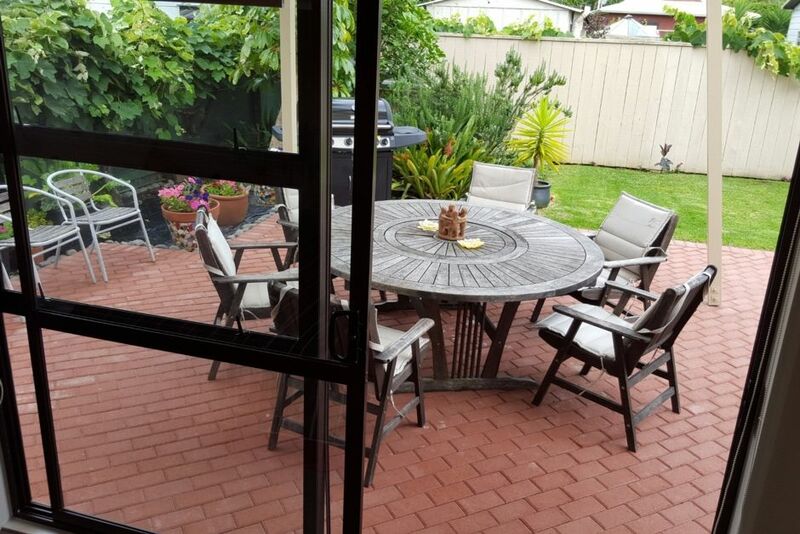 Great location, fully fenced great for our family dog and children. Bach very well set up with everything you need. Good location, walking distance to town. Good location, walking distance to town. Great for pets, nice walks along the river. Lovely home, had everything we needed for the week. Lovely home, had everything we needed for the week. We very much enjoyed our stay. A great location for walking our dog every morning next to the estuary.